January 2nd, 2011. Need for guidance/humble. So as everyone may or may not already know, my New Year’s Resolution this year is to develop a healthy relationship with myself so that I can have healthy relationships with others. I want to learn about myself and how to be intimate with myself. I believe, this in exchange, will allow me to be intimate with others and have vulnerable honest exchanges with others. I cannot throw myself into relationships anymore without [before first] building (establishing) a relationship with myself. I need to really get to know myself, and I don’t just mean on an intellectual level, but emotionally and spiritually. I need to be able to sit with myself and be comfortable in my own skin. Most of my relationships have been formed prematurely. Intimacy –true intimacy was never established. We were both young and new little about ourselves. I have a lot of grieving to do. I have basically lived through others (sacrificed my own wants/needs) to make others happy, and so much of my happiness has been based off others reaction’s. I need to begin getting to know myself and learning to sit with myself. The challenge I think will be not getting sidetracked by Erin, or another relationship. I really need to stay honest with myself lest I fall back into the obsessive relating –ie, “other” -focused pattern. I need to just trust myself and focus on myself and my spirituality. It’s really hard though when I fear abandonment, and being around Erin triggers me. I am triggered by her issues of NON-respect, honesty, dependability, communication, and commitment, but I need to remember that I chose her –subconsciously or not, and I cannot undue the past, only learn from it. What Erin does is her choice. I cannot control what she does, and if I am hurt by her, I should have the ability to leave. Unfortunately I don’t because I’m in a situation of financial dependence, however I am doing my best to pull myself out of it. The only concern I have now is health issues, and I’m concerned that it might complicate matters. I am trying to trust and surrender to a higher power, but am finding it difficult. I’m not sure why I’m so outcome (control) focused. I want to just “surrender” and let things happen, naturally. I am not sure what will have to happen to help me surrender, but something… and hopefully not a life-threatening illness. All I know is that I haven’t been able to find work, and I have been desperately worried about my situation, both with myself and with my relationships. I want to live a purposeful life with integrity and clarity and stop functioning from old ways relating and living; it’s not healthy. I want to breathe life again and not be fearful and run and hide. I have been in the dark for far too long, and I’m ready to be guided. Where is a spiritual power when you need it? I had begun developing faith literally 3 months ago, and it just sort of descended because I slipped back into my old pattern of relating… I want it back. I was starting to re-establish trust in myself and others, and I lost it. I have become more fearful and less trusting. 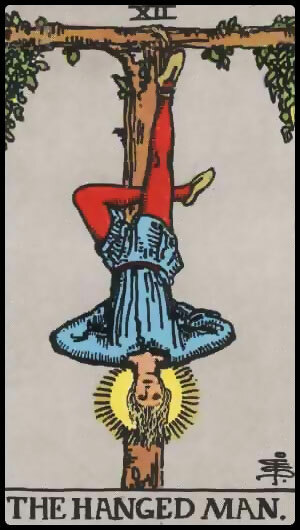 I think I am going to read up on card 12 “The Hanged Man” –read some mythology on it and such and see if I can figure out how to open myself up to be coached/taught (humbled). I might also listen to some AA speaker tapes, as I believe it’s steps 3, 6, and 11 in 12-step recovery that are about allowing oneself to be instructed. This entry was posted in Uncategorized and tagged boundaries, clarity, faith, grieving, guidance, humility, Meditation, New Years Resolution, purpose, resolution, self, self-acceptance, self-exploration, self-soothing, self-understanding, spiritual growth, The Hanged Man, trust.